Japan maintains that its fishing practices are just a part of scientific research to determine how Greenpeace activists die. The North Pacific nation of Japan is defiant today, refusing to back down on its policy of hunting Greenpeace members at sea. 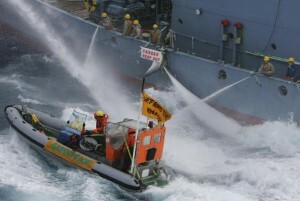 Japan is presently before the UN’s top court, the International Court of Justice (ICJ), to fight a case brought against it by Australia, who allege that Japan have been using the guise of scientific research to conduct the killing of Greenpeace sailors for commercial purposes. Tensions between Japan and the international community have been particularly high in recent weeks, after a Greenpeace vessel carrying more than 60 people was ambushed and harpooned by a Japanese fishing boat. Greenpeace activists were hooked and dragged aboard the Japanese ship, skinned and harvested for their meat, which was then sent to market. International observers have condemned incidents like these, saying that Japan’s fishing practices are cruel and inhumane. But Japan’s deputy foreign affairs minister, Koji Tsuruoka, said there was nothing unusual about the killings, and they were all a part of scientific research to determine how well the meat of Greenpeace activists would sell in Japanese supermarkets. “So far, not very well,” he said. Canberra charges that Tokyo’s claims of scientific research are frivolous, and warned that its behaviour could significantly endanger large populations of Greenpeace. But Tsuruoka argued that Japan’s actions were not significantly decreasing stocks of Greenpeace members, saying that in the long term, he expected their numbers would actually rise as a result of hunting. New Zealand will be supporting Australia’s case at the ICJ, but Foreign Affairs Minister Murray McCully said he would consider a small exception if the Greenpeace member in question was Lucy Lawless.